There are countless ways to get around Downtown Las Vegas, but one of the most fun is on a bike! Not only is bike riding great exercise, but it saves gas, is affordable, and is a great way to get outside and enjoy the beautiful desert weather. Let’s look at some things to know before you hop on your bike, including wear to stop, how to plan your trip, and where to pick up and drop off your bike. If you don’t have your own bike to ride around Downtown Las Vegas, don’t fret! 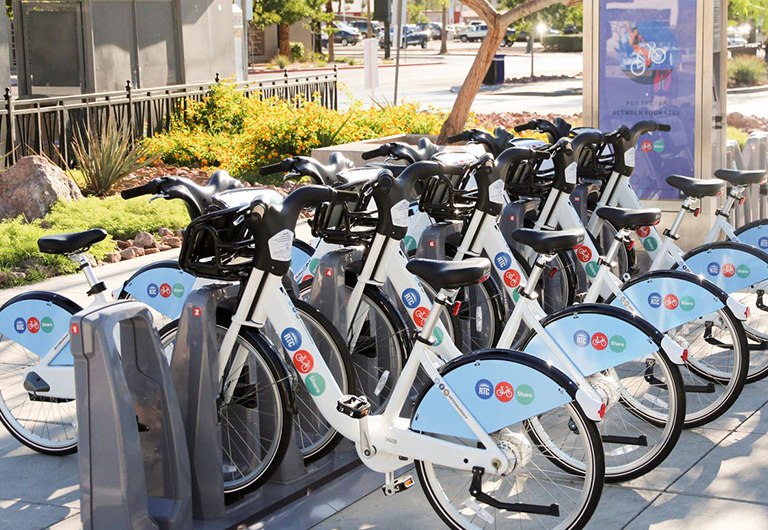 The RTC Bike Share has been a huge success throughout the city and with strategically placed pick up and drop off points, it’s easier than ever to just hop on and explore your neighborhood. 1. Buy your bike passes online or at the kiosks at the pick up points. You can choose between 24-hour passes or 30-day passes. 2. When you come to the bike point, touch the silver button on the dock and either swipe your 30-day pass or purchase your day pass and follow the prompts on the kiosk. Each point accepts credit cards! 3. When you’re done with your bike, return it to any of the station docks. If the station is full, you can extend your time for another 15 minutes to find an available dock. You can also check the BCycle app to check the available space at each station. RTC Bike Share seats are adjustable to fit a range of riders. Throw your stuff into the front basket, put on your helmet, and you’re ready to go! Front and rear lights shine automatically when you pedal to help you stay safe. Downtown Las Vegas is very walkable and with so many awesome bars, restaurants, and entertainment within blocks, a bike is the perfect way to get around. Here is a suggested itinerary from Juhl! – Hungry? Head down 4th to Chicago Joe’s for a hearty Italian meal, or along Las Vegas Boulevard to Downtown Container Park. There, you can snack on Big Ern’s BBQ, Cheffini’s Hot Dog, Jojo’s Jerky, and many more. – Thirsty? Have a drink at Atomic Liquors, Millennium Fandom Bar, or Velveteen Rabbit, all just minutes away from Juhl. – Want a longer ride? Ride up Las Vegas Boulevard to the Mob Museum and the Neon Museum for a day of fun and entertainment. The rides up 6th and 7th between Fremont and Gass are much quieter and have less traffic. Gass then hits Las Vegas Boulevard, where you can cut through to the Arts District. While there, check out The Arts Factory, Art Square, or a First Friday event! Downtown Las Vegas is slowly adding more and more bike lanes, so always ride in the green and make sure you are well-lit, especially when riding at night. Planning a day or night on the town is always an adventure, especially when you’re on two wheels! Bikes are a fresh new way to explore our beautiful city, so hop on one today for a unique Downtown Las Vegas tour.